There is so much on offer in Malaga! I still remember my first “tapas” meal in Malaga back in 2007. I was visiting Malaga for the first time and had no idea what to expect– I’d barely been in Spain a month. Three minuscule clay dishes later, I made the conclusion that tapas in Malaga left a lot to be desired. Little did I know that nearly ten years later Malaga would become one of my favorite cities in Spain for tapas. Today Malaga is a wonderful place to taste some of Spain’s best tapas. The tapas in Malaga are generally not free (though you may receive a complimentary tapa with your drinks in some establishments), but they’re well worth paying for. The city is an exciting mix of traditional tapas bars and modern tapas bars, each offering a unique spin on Spain’s famous small plates. Tapas and wine in Malaga. But Malaga isn’t all about the tapas! This gorgeous city is also home to a handful of fantastic places for a hearty Andalusian breakfast, Spain’s most colorful local markets, delicious fried fish shops, and some of the best chiringuitos (beachside seafood restaurants) in the country. If you’re wondering where to eat in Malaga, rest assured that there are plenty of wonderful places to choose from! 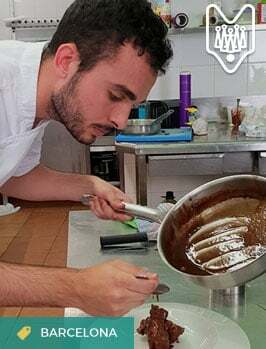 I visit Malaga various times throughout the year since Devour Spain offers both Malaga food tours and Malaga tapas tours there. These trips are the perfect excuse to do lots of eating (I mean research!). Here are some of my personal favorite places to eat in Malaga, which I update each time I visit Malaga. Malaga’s tapas follow what I call “the Seville system” (though perhaps we should just say the Malaga system here!). These are three serving sizes of the same dish. Media raciones and raciones are meant to be shared, and tapas are generally individually sized, although many people share a few tapas among close friends or family. Spaniards don’t mind double dipping! Usually in Malaga, you pay for your tapas unlike in cities such as Granada or even Madrid where “free tapas” are included in the price of your drink. This allows you to have full control of what makes it to your table, and the quality is generally better than free tapas places. Of course, it all depends on where you go! Tapas prices in Malaga range greatly between the traditional tapas bars, where a small tapas of potato salad may cost under €2.00, and a more modern bar, where a tapa could be closer to €6.00. 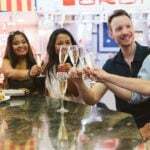 Unfortunately, modern “gastro bars” have become quite trendy in recent years, so you really have to know where to go so that your money doesn’t go to waste! Never rush your tapas experience. Order little by little when out for tapas in Malaga. Tapas in Andalusia usually come out quickly, as they are prepared in advance and reheated when ordered. Often they’re even microwaved to heat them up (this is not considered a bad thing in the right place). The best way to enjoy tapas in Malaga is to order little by little, pairing each tapa with a drink. This ensures you won’t over order and you’ll be able to enjoy everything while still hot! 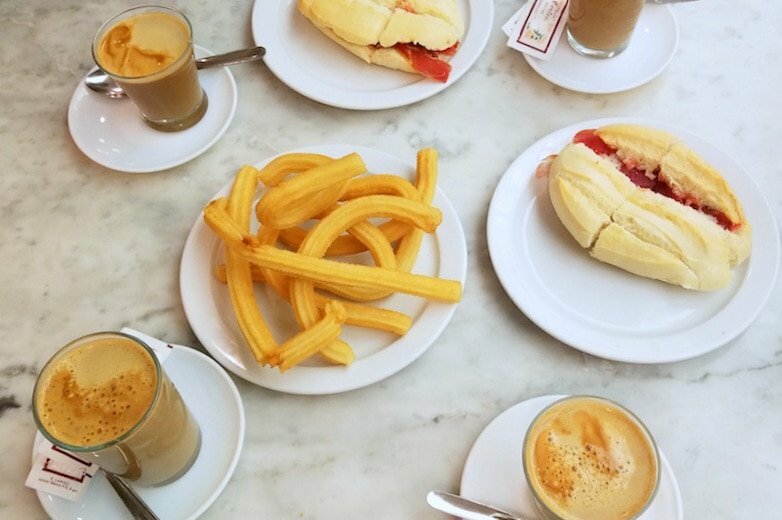 Tapas with an expert: I may be biased, but I highly recommend a food tour or tapas tour while in Malaga (even if you don’t sign up for ours!). This is a way to really see the local food culture come to life, and visit stops that are easy to miss. In the hands of an expert guide, you’ll meet some of the chefs and shopkeepers behind the food, and learn their fascinating stories. In Malaga Devour Spain offers an Evening Tapas, Wine and Culture Tour and a Daytime Tapas, Market and City Tour. Check us out! Literally translated to “smurf” these are little breakfast sandwiches that are usually filled with tomato and olive oil, and often jamón— Spanish cured ham. When they’re made properly, the freshly grated tomato and local olive oil work their magic and it is one of the most satisfying ways to start the day! 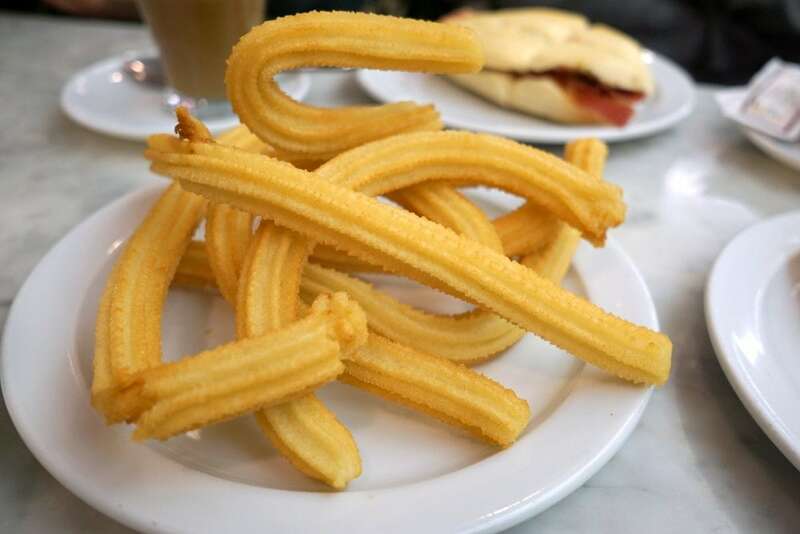 Malaga’s delicious style of churros. 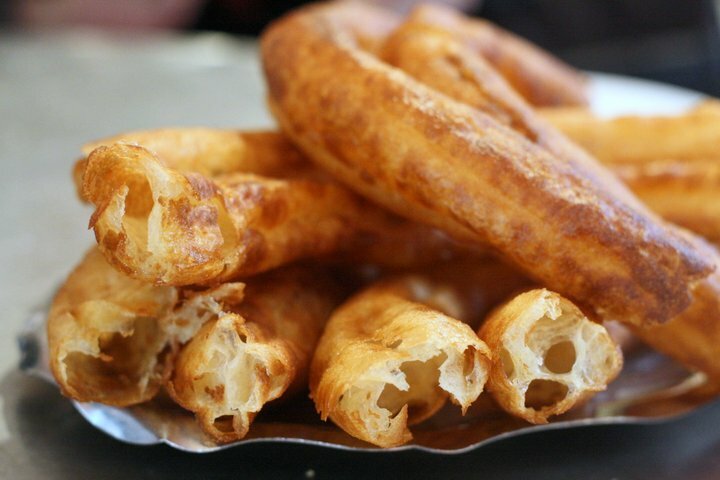 Another breakfast option (or an afternoon snack) is the Malaga version of churros, called tejeringos. Just don’t order these for dessert– the locals will look at you like you’re crazy! If you want to get daring with your toast toppings, try zurrapa, a rich lard spread with ground meat. Delicious fried fish in Malaga. 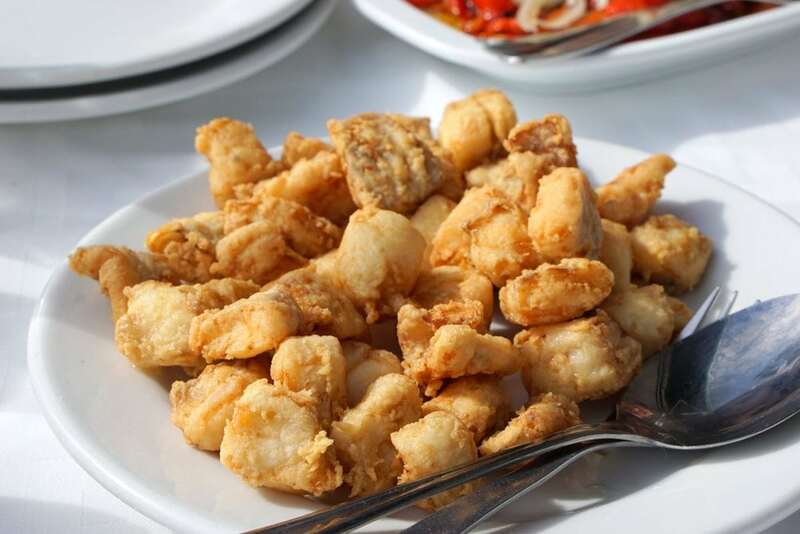 Malaga is famous throughout Spain for its top quality fried fish. 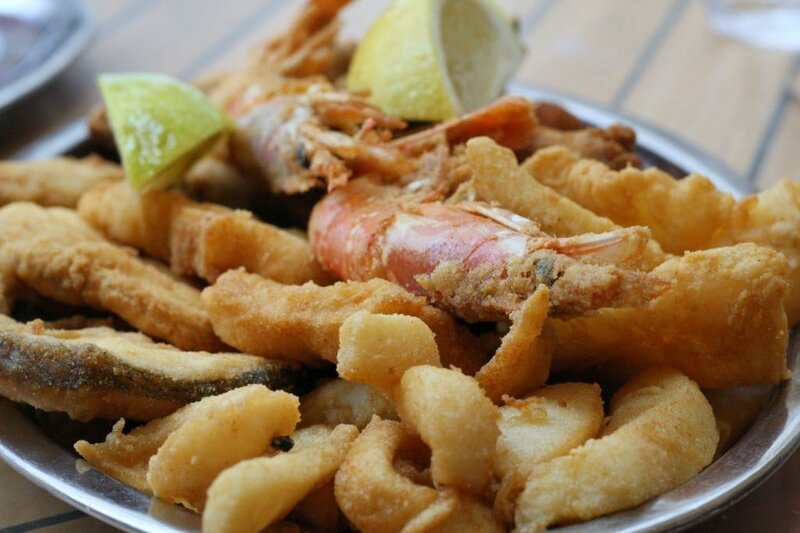 I especially love pintarroja, or sand shark, which is covered in a cumin-lemon batter and deep fried to perfection. Fried anchovies with lemon and parsley– yum! Anchovies are especially important in Malaga (the locals even call their football team boquerones— anchovies!). They are prepared many ways, but I love them butterflied and fried. My favorite– espetos de sardinas! 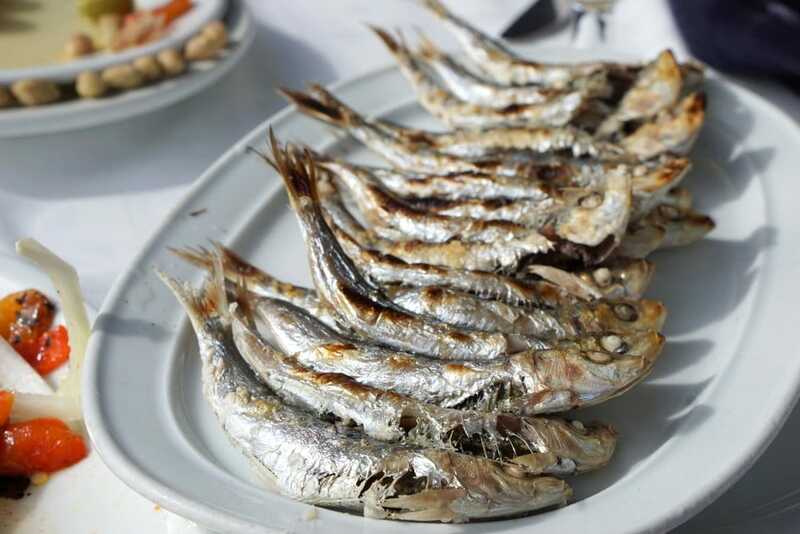 The best sardines in Malaga are called espetos after the sticks that they’re grilled on. Head out to the fishermen’s neighborhoods of Malaga for the best espetos— and don’t forget, only order them in the months without an ‘r’! Bright and fresh Malaga salad. 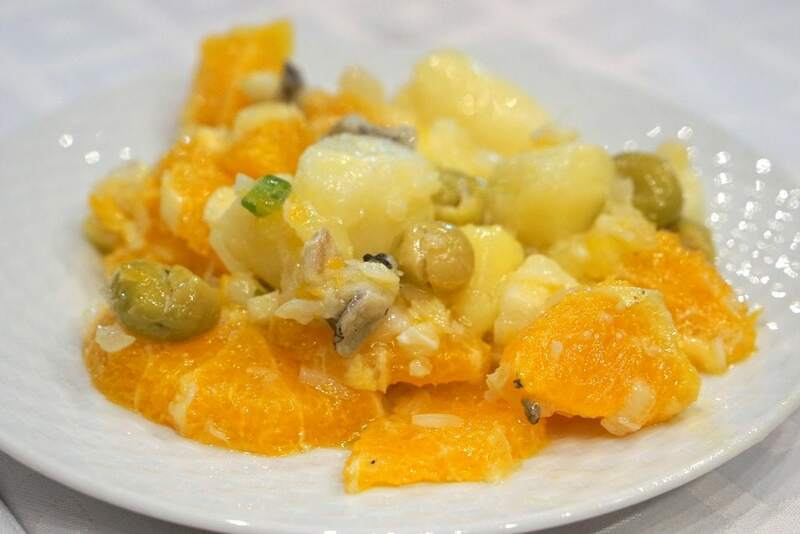 This traditional Malaga salad (ensalada malagueña) is made with salt cod and oranges. It is a refreshing (but filling) tapa that you’ll find in most of the city’s traditional tapas bars. A modern ajo blanco with toppings. Before tomatoes came to Europe with Spanish conquistadors (they were a food brought from the Americas), Spanish dishes like gazpacho and salmorejo didn’t exist. 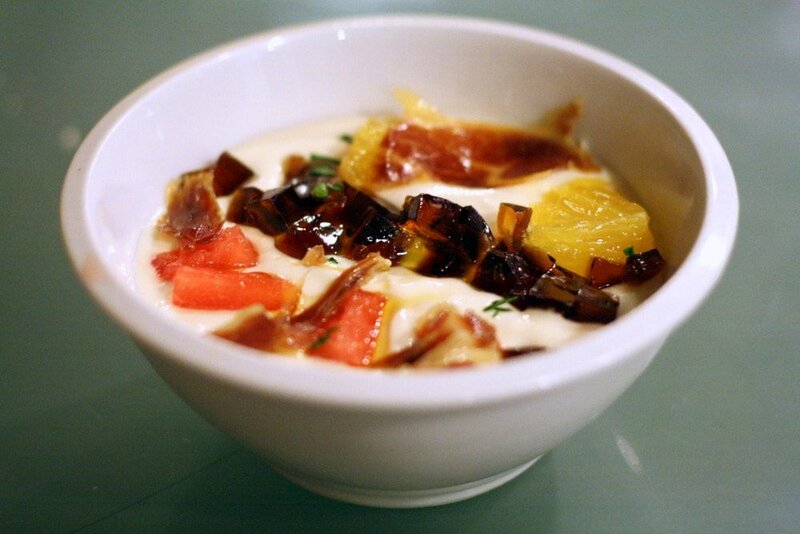 What they ate instead is called ajo blanco, a delightful cold soup made with garlic and blanched almonds. You’ll still find this Andalusian specialty in some of Malaga’s most traditional restaurants. Porra is like salmorejo– but often served with tuna instead of ham and egg. And after tomatoes were introduced, porra came about! 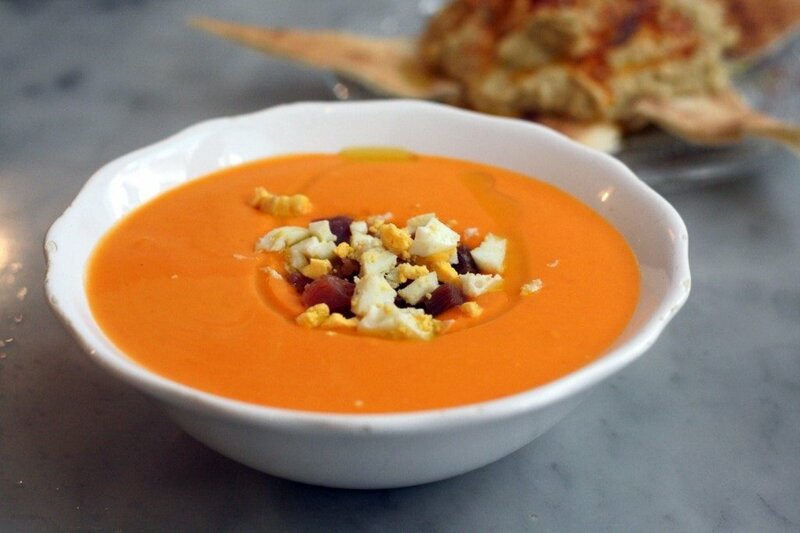 Porra is similar to salmorejo, and is made with tomatoes, stale bread, vinegar and olive oil. But instead of being topped with hardboiled egg and ham, it’s usually topped with tuna. It is delicious and refreshing! 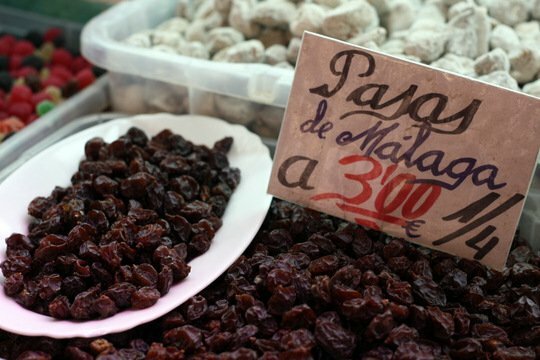 It might sound crazy, but yes, you must try raisins in Malaga! 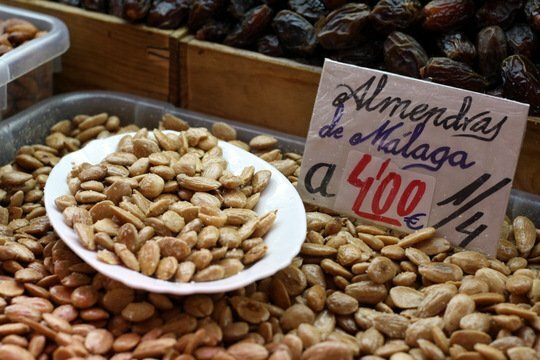 Visit the Atarazanas Market (we go there on our daytime Malaga food tour) and sample the delicious local Malaga raisins, used to make some of the famous sweet local wines. While visiting the market (or while strolling the city center) pick up some local almonds, some of the best I’ve ever had. This is another Malaga specialty that sounds simple enough, but is truly wonderful when you taste it. The almonds are perfectly toasted and salted and make the best snack. 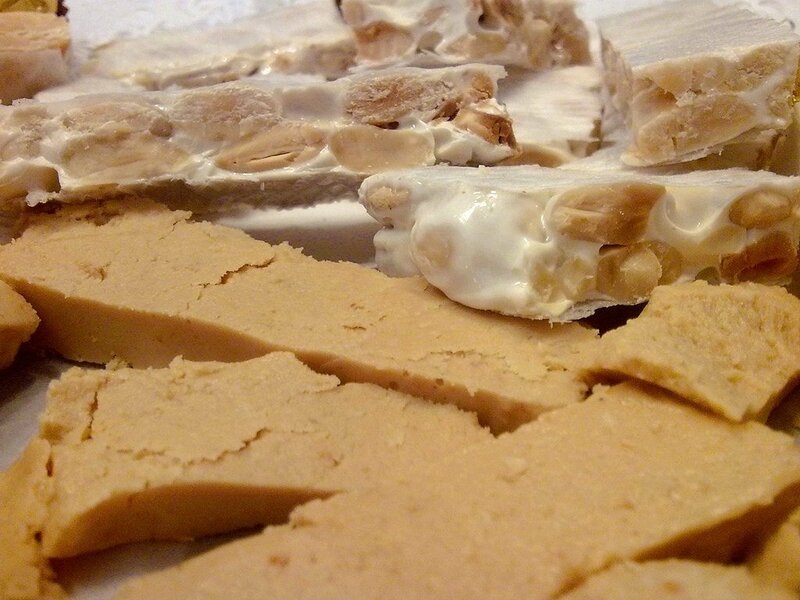 If you have a sweet tooth you must taste Malaga turrón. This sweet nougat is the perfect snack or dessert. It’s usually full of nuts (most likely almonds, of course) and isn’t too hard to bite into. 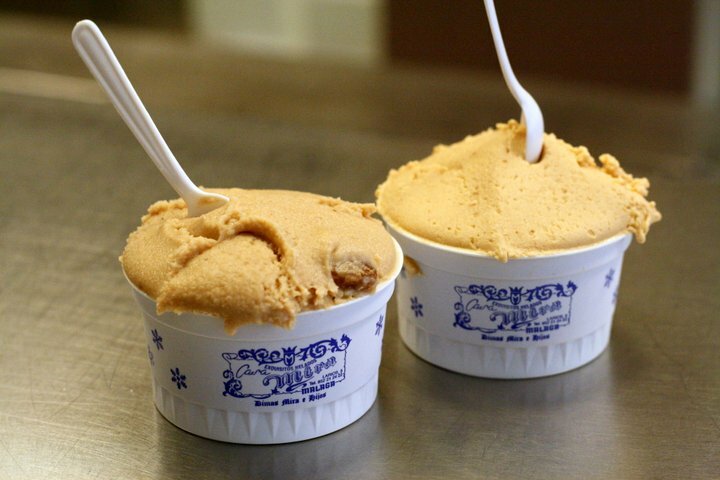 Malaga has some excellent ice cream shops (check out the historic Casa Mira or delicious Heladería Freskitto), which often offer seasonal flavors as well as the classics (turrón is one of those!). Delicious sweet wines in Malaga. Malaga is world famous for its sweet wines, mostly made from the Moscatel and/or Pedro Ximenez grapes. Even if you aren’t usually a fan of the sweet stuff, give them a try, as some have a cutting acidity that leaves you wanting another sip. And if you must, there are plenty of dry fortified wines in Malaga as well! Modern wines in Malaga are becoming a big deal. 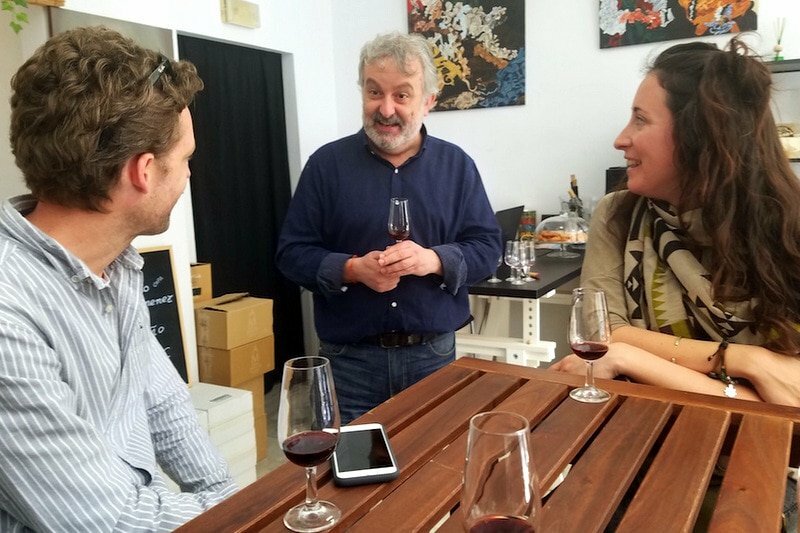 People are straying from the bulk wine of the past and really dedicating themselves to producing some of the best dry wines in the region. Try the whites made with the Moscatel grape– the same grape used in the sweet wines. On the nose you’ll be expecting honey, but then you take a sip and it’s as crisp and dry as can be! Some of the yummy spreads at La Recova in Malaga. This is hands down one of my favorite breakfast spots in Malaga. If you order the house specialty you’ll get a piping hot coffee and a large piece of toasted bread. Then you’ll have about eight toppings to choose from– three different lard spreads, two homemade marmalades, extra virgin olive oil, fresh tomato… the hardest part is dividing your toast into enough pieces to try it all! Churros! This is one of the most classic places in town to have them. So many people love them that they have an entire little alleyway serving them all day long. If you are looking for a more modern breakfast (think green juice and an avocado toast) Dulce Dreams is your place. They also do delicious homemade cakes. 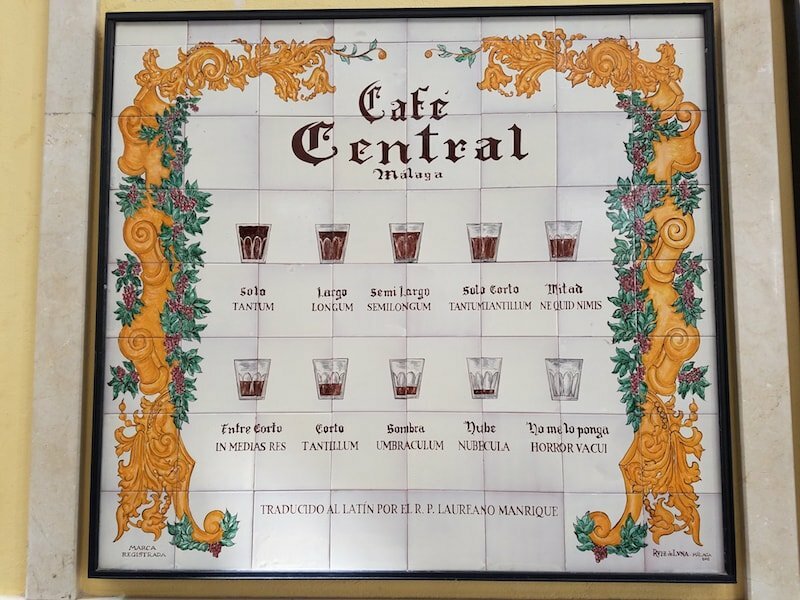 The many coffees in Café Central. Another of Malaga’s iconic locations, Café Central is one of the city’s most classic cafés. Come for breakfast and enjoy a pitufo or maybe some homemade terjeringos! Try Both! Join our Daytime Malaga Market and Tapas Tour for a true taste of Malaga. 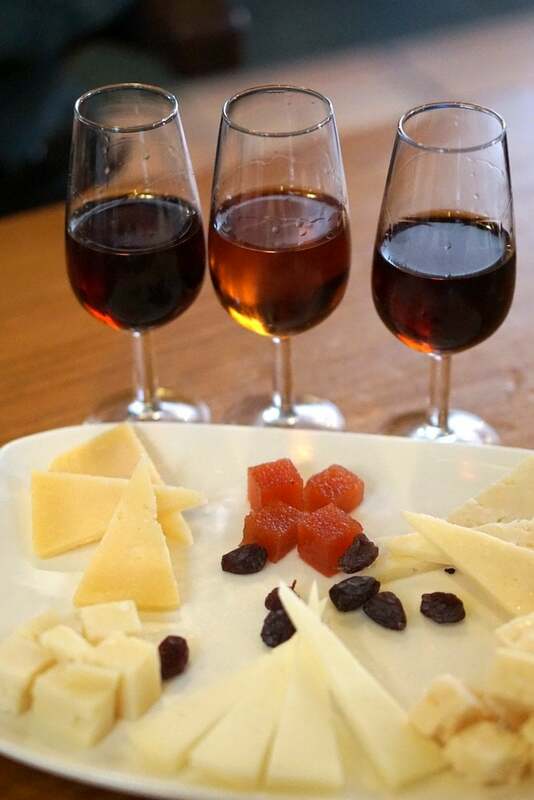 El Pimpi in Malaga means sweet wines and cheese— what could be better? It’s touristic, but iconic at the same time! Located in the heart of Malaga, El Pimpi is a must-visit for any first-timer in Malaga. Admire the sherry barrels signed by celebrities (more than one you’ll recognize) and enjoy some of the best cheese and charcuterie in town. The incredible mercado in Malaga. I LOVE this local Malaga market and have ever since the first time I stepped inside. It’s a gorgeous building (the former Malaga shipyards, centuries ago!) and home to one of the best fish markets in Spain. There are also some yummy tapas bars inside, serving up fried fish and more. Delicious tapas in Malaga at Uve Doble. For tapas with an upscale twist, try Uvedoble. It’s a tiny tapas bar, so either get there early or make a reservation in advance. Their ajo blanco is a delicious choice! Fun and filled with locals, La Tranca does cold beer and yummy empanadas. It’s a place where a lot of younger people (25-35) hang out, and a fun place to have a quick beer before something more substantial. 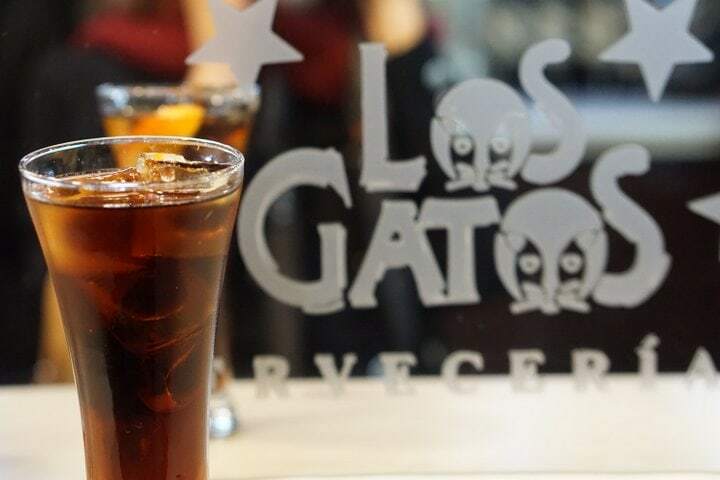 Started in Madrid, Los Gatos is as Madrileño as it gets– so what’s it doing in Malaga? Well, husband and wife owners decided to divide their time between the two cities (I don’t blame them!) and they brought Los Gatos with them. Visit for excellent tostas (delicious toppings on toasted bread) and vermouth on tap! Probably one of the most peculiar bars in all of Spain, this Semana Santa (Holy Week) themed bar goes to show just how much the locals love the Easter traditions. Smell the incense and see the many virgins adorning the space, all as you chow down on yummy traditional tapas and drinks. The famous bull burger at Wendy Gamba. 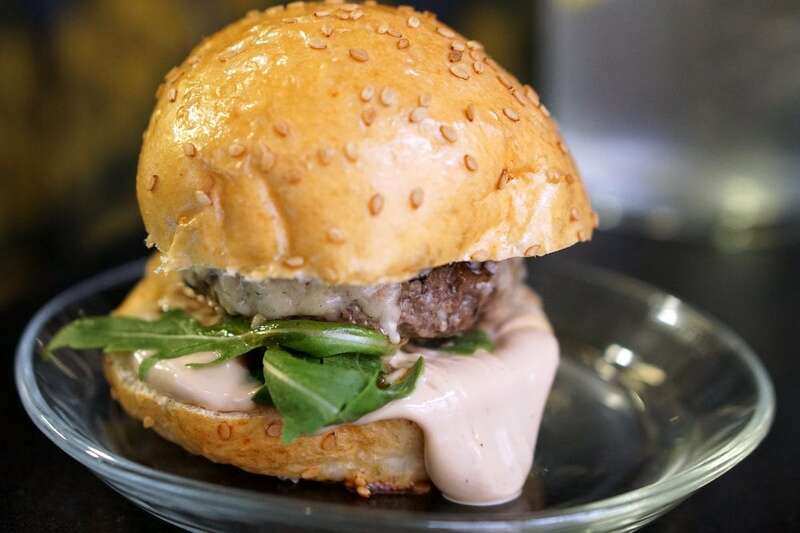 The food at Wendy Gamba is good, but really, you come for one thing: the bull burger. A mini hamburger made with rich bull meat and topped with smokey cheese, it is a tapa to go crazy for! It’s a must on anyone’s self-guided Malaga tapas tour! Delicious wine and Iberian ham tasting on our Devour Malaga tapas tour. 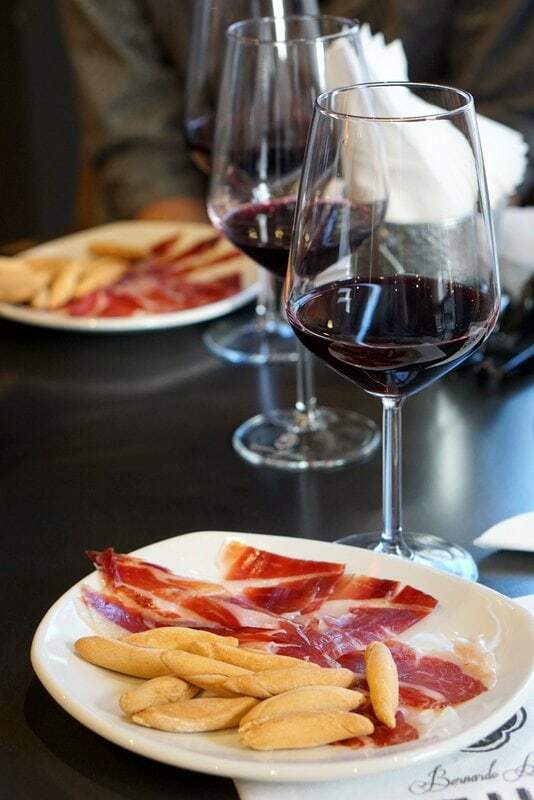 If you are a fan of Spanish Iberian jamón, then this is your place. 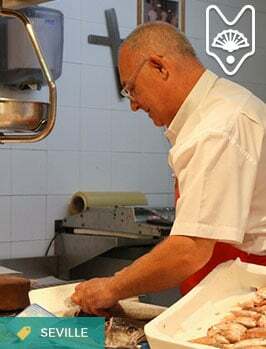 The family behind Beher has been producing top quality Iberian acorn-fed ham for decades, and they employee the best expert slicers in their deli/tapas bar. You can sit down for a tapa of jamón and a great view, or simply buy some freshly sliced jamón for later. A delicious tapa of flaminquín. 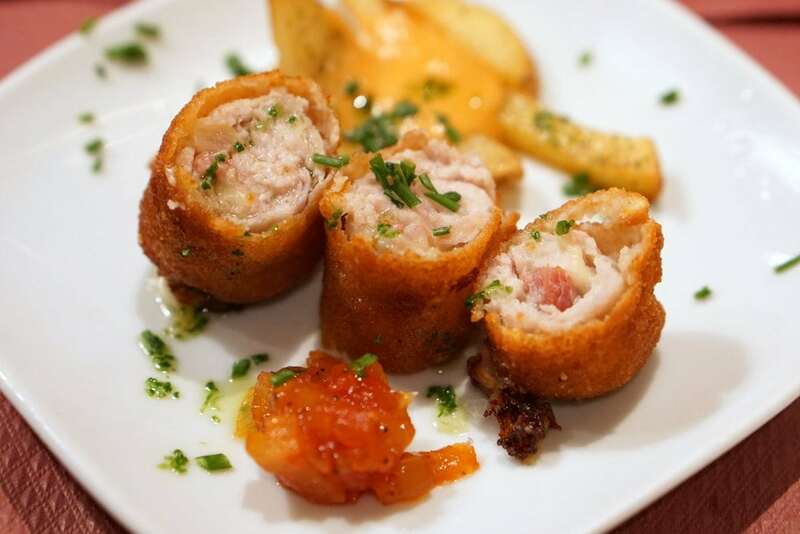 This comfortable tapas bar is on of Malaga’s most popular– so reserve if you can. Their tapas are high quality and inventive, and they have some great wines by the glass. Desserts are great too– so save room! 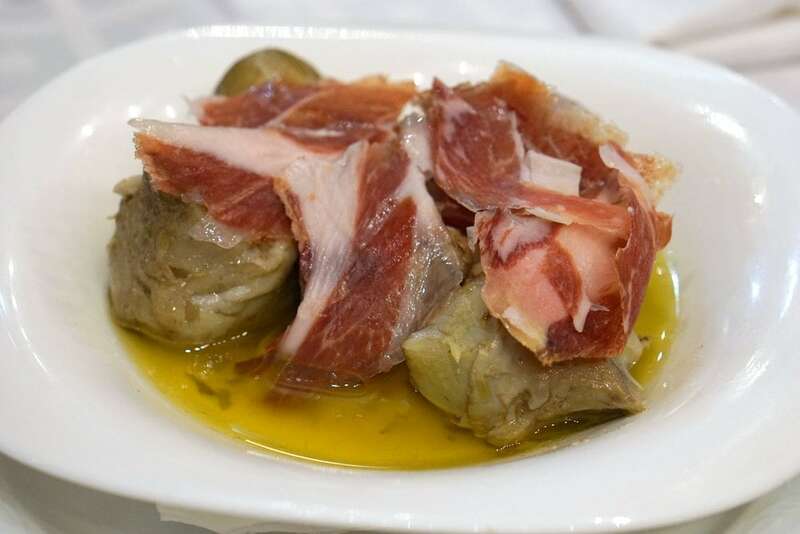 Mariano’s specialty– artichokes and ham! I love the family atmosphere at Meson Mariano, owned by Mariano himself, who comes in every morning at 9am to start preparing for the day. The most famous dish here is the artichokes, which are prepared just about any way possible. They’re delicious… as is everything! A mixed platter of fried fish. 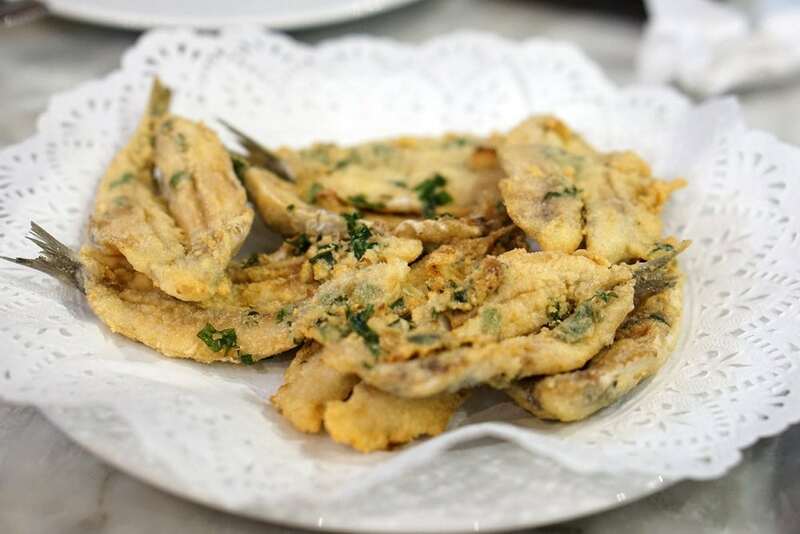 Venture out to Bar La Comba for some of Malaga’s yummiest fried fish. Sold in paper cones, you can grab and go, or eat on their sidewalk tables. It is super casual, but if you love fried fish, don’t miss it! Delicious shrimp tapas in Malaga. 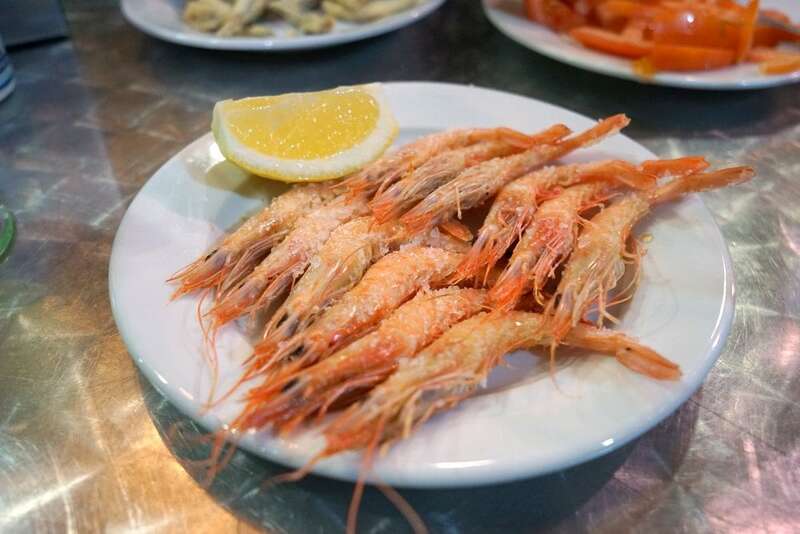 In downtown Malaga Casa Vicente is known for its shrimp (it’s been selling them since the 1960s! ), served by the plateful with a pink bucket on the side for the shells. Sprinkled with salt and a touch of squeezed lemon, they are perfect with a cold beer any time of day. The Pedregalejo area of Malaga. If you head to the part of Malaga called Pedregalejo, you’ll be in for a treat. The beach is lined with restaurants and chiringuitos, beach side seafood shacks. Pez Tomillo is far from a shack, but it is a great restaurant with modern interpretations of Malaga classics, and really yummy seafood too. 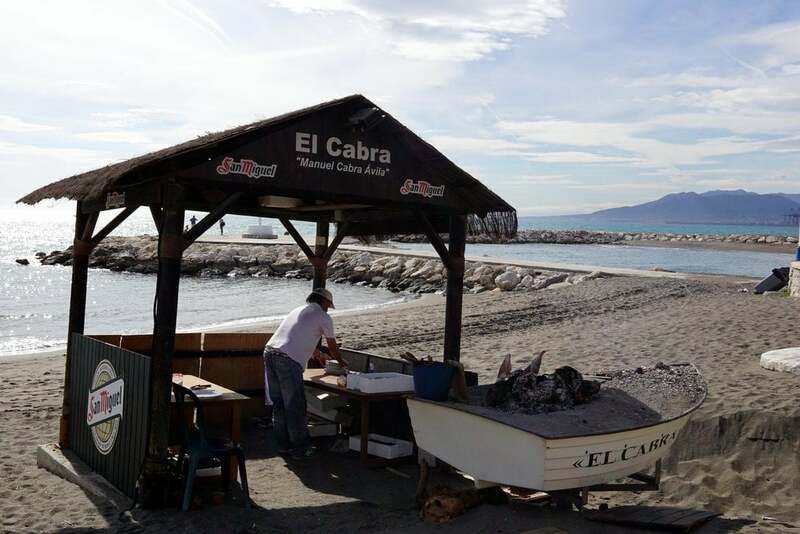 Another excellent (and more traditional) seafood restaurant in this part of town is El Cabra. Their espetos de sardinas and roasted red peppers are to die for. I try to make a trip here every time I come to Malaga– even if it means taking a taxi straight to the train station after lunch! And the most famous of Malaga’s beachside bars is El Tintero II. The quality of food isn’t quite that of the others, but the experience is completely unique. Waiters will walk around, auctioning off their plates, fresh from the grill. Most plates cost 6€– though some are more expensive. You accept what you want, and at the end of the meals they’ll come and count your plates to give you the bill. It’s a great time, family friendly, and beautiful chaos– a must! 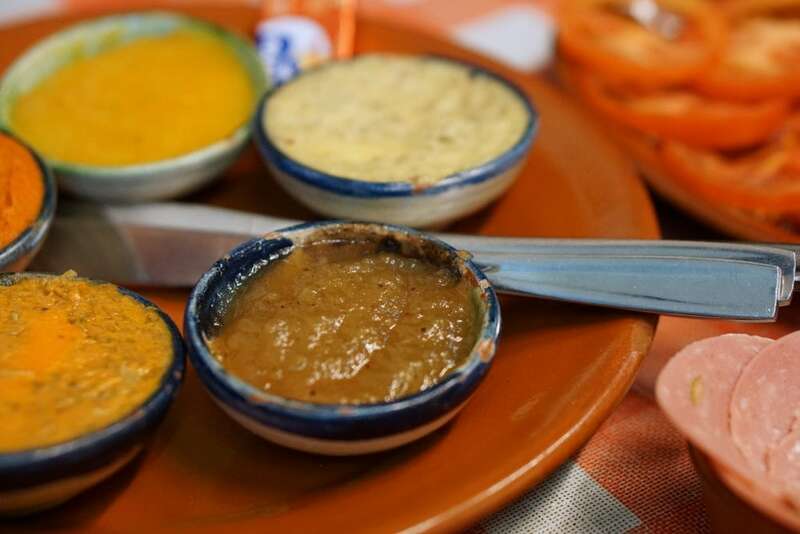 The authentic atmosphere of Antigua Casa la Guardia– visit on our Malaga tapas tour! 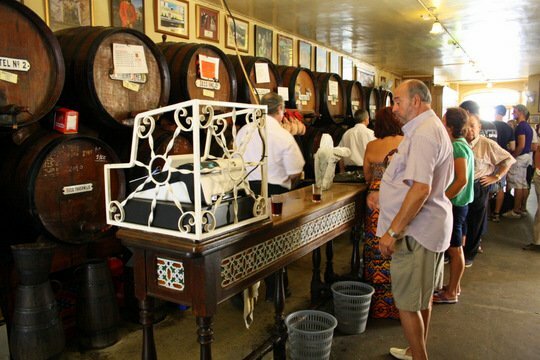 This is one of the most traditional wine bars in Malaga, and they’re known for their old barrels filled with Malaga’s fortified wines. 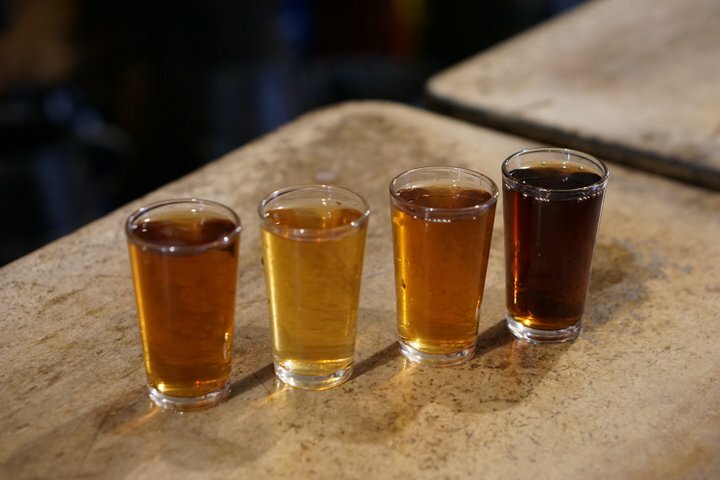 Try the pajarete (sweet, but not overly so) or a seco trasañejo for something dry– with a kick! 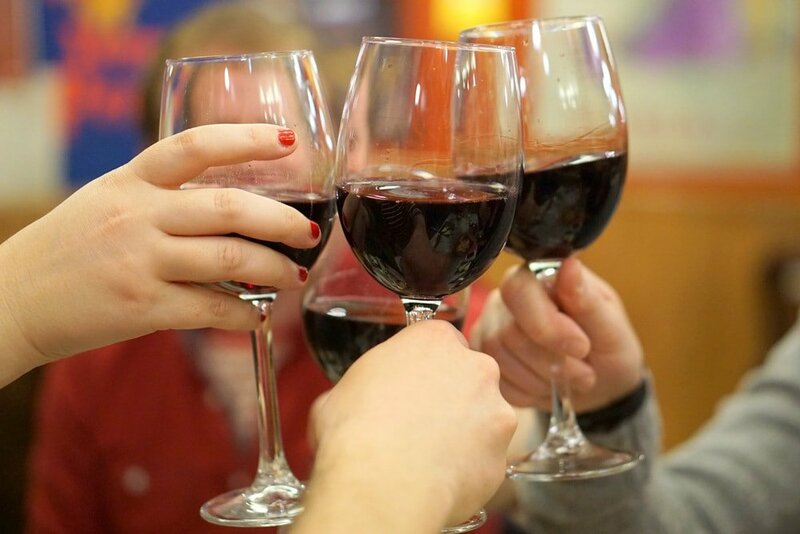 Red or white, you can’t go wrong with Spanish wine. Wine lover? You must try Los Patios de Beatas, where this wine shop/bar/restaurant serves a huge variety of wines, and many of them by the glass. If you stay for dinner, you can order their tasting menu, and enjoy a wine pairing. Don’t miss the local Malaga dry wines, which are up and coming and a great value for money! Wine and delicious French Spanish fusion food. 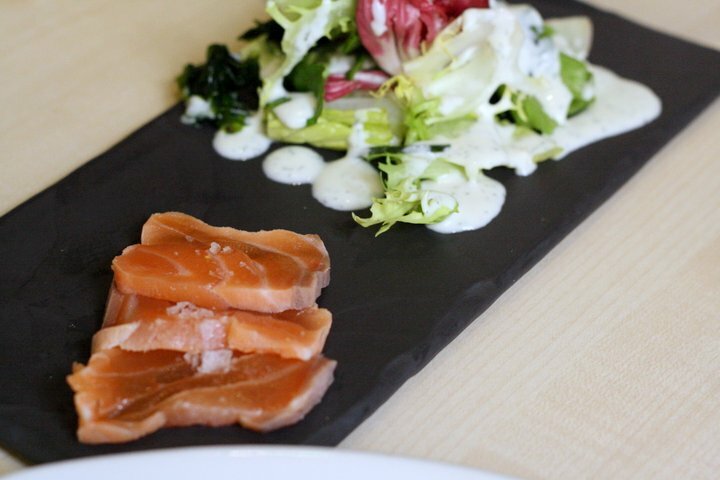 For a delicious French-Spanish fusion experience (in a lovely little restaurant) try La Luz de Candela. 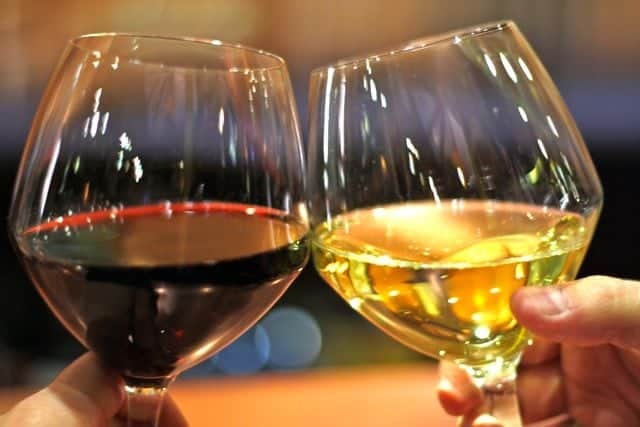 The wine list is great as well– which is why I’ve listed it here– but don’t go hoping for tapas, as they serve only 1/2 raciones and full raciones. A bread and cutlery charge is common to see on your bill and will range from 1€ or less per table, to 2.50€ per person, depending on the restaurant. In fine dining establishments, it might even be more, if it also includes a few appetizers. If you don’t want bread brought to the table, specify sin pan por favor, though unfortunately sometimes you’ll still be charged. Feel free to complain if this is the case, though the easiest thing to do is to eat like a Spaniard and enjoy your bread! Don’t take offense if in a traditional place, the waiters are running around and slam down your drink– it’s not rude, just a part of the show they put on! You often have to be assertive to get a waiter’s attention– feel free to signal him/her over. This is not rude. Don’t expect to be asked if you want a second drink, more food, the cheque etc. Just be assertive and ask! 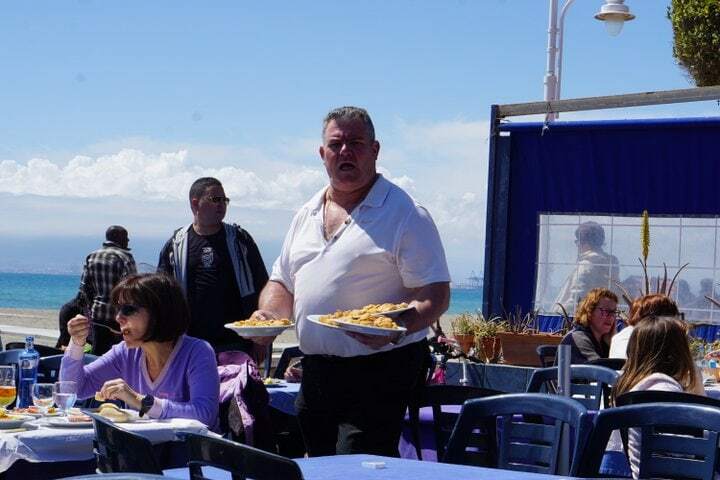 You aren’t required to tip in Malaga, but rounding up the bill and leaving about 10% for excellent service is definitely appreciated (I always tip my servers). Waiters earn a very low monthly wage in Spain. Learn to love the afternoon merienda. 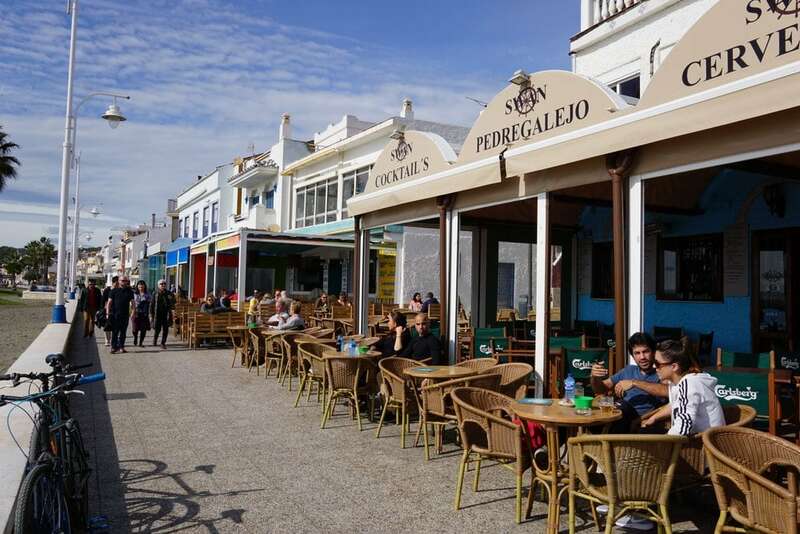 From around 5:30 to 7:30 you’ll see locals having a drink and a bite to eat in local cafés and pastry shops, instead of having dessert right after a meal. And remember– an afternoon snack at 7:30 pm means dinner is late! Do as the locals and don’t dine before 9:30 pm! Malaga is a city I love more and more with every visit. It’s an incredible combination of old and new, tradition meets modern. You do need to know where to go, however, because so much of the city is catered to tourists, and the quality of many restaurants is low. But, luckily, with a little research or guides like this one, you can avoid the tourist traps and taste the real Malaga– with is so worth it! 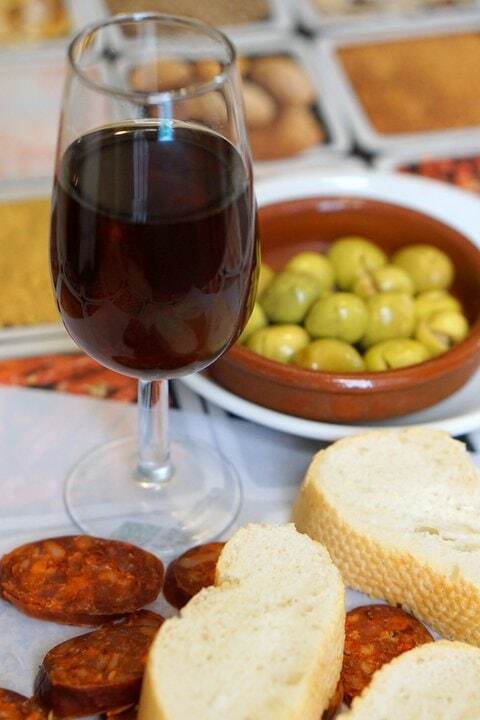 Learn about Malaga’s incredible foods and wines on our in depth local food tours. 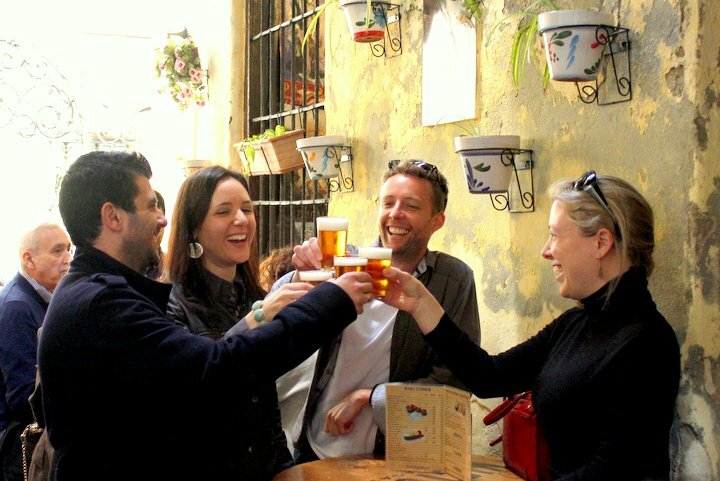 If you’ll be visiting Malaga sometime soon, we’d love to have you join one of our Malaga Food Tours or Malaga Tapas Tours. Our tours in Malaga do a great job at mixing Malaga’s long history, vibrant culture, and great food, so that at the end of the tour (which runs around 3.5 hours) both your bellies and your minds will be full! 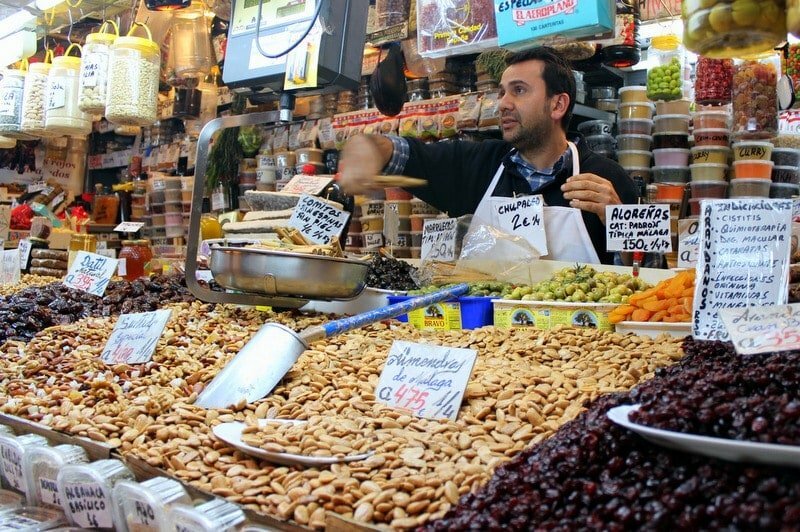 You’ll try 10+ different foods at a variety of traditional, family-run establishments on both tours– during the day you’ll get to visit the local market and during the evening you’ll do more of a tapas crawl. Both experiences capture what it’s like to live in Malaga, and you’ll finish feeling like you want to stay in town a lot longer I’m sure! You can reserve spots online here: book Malaga food tour. Do you have any insider tips for eating and drinking in Malaga? Leave a comment! 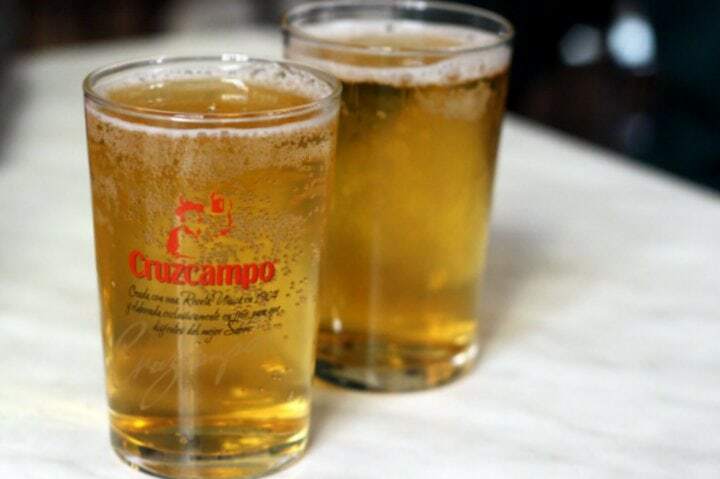 If you’ve been, what’s your favorite Malaga specialty? I’ve been enjoying your postings. We are looking at spending a month in Spain, in April and are wondering where the best City/Town to base ourselves. We love food, wine and markets and want to visit Sevilla, Cordoba, Granada and Malaga but where is the best place to stay for a month and ‘live like a local’? You should add Cadiz and Jerez to the list too! It’s such a tough question, I’d probably say Seville since it’s the biggest of the cities, and only about an hour away by train from Jerez, Cordoba, and a bit more from Cadiz. Malaga and Granada are farther, however. The food is excellent as are the markets. Malaga would also be great– a smaller city, the sea is at your doorstep… and the main market is incredible. But… did I mention Granada is one of my favorite cities in Spain?! As you can see, the choice is hard! Granada isn’t as well connected. I don’t know Cordoba as well as the others… Good luck and enjoy! 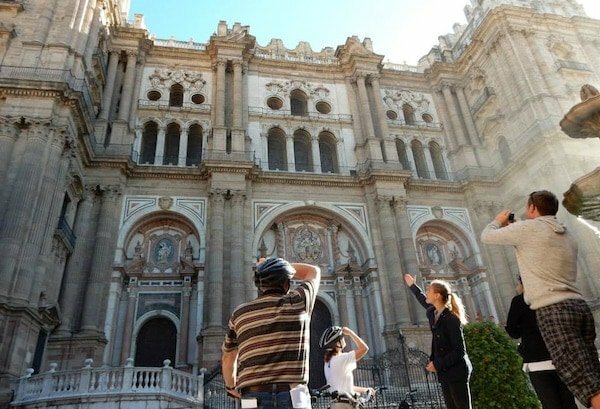 Mejor sitio para quedarse es Sevilla o Málaga, alquilas un coche y te mueves de un sitio a otro, asi os da tiempo de visitar las ciudades más importantes, pero no os podéis olvidar de los pequeños pueblecitos con encanto, incluyendo la ruta de los pueblos blancos de andalucia. Os va a encantar. I love in Rincón de la Victoria, 20 minutes out of the centre by car. We have some great chiringuitos here, but May I suggest you try Casa Kiko? 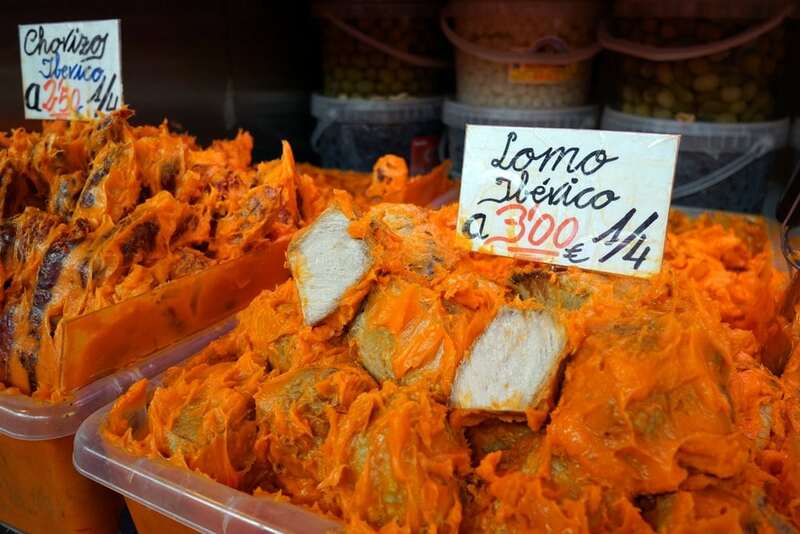 They’re known for their fresh fish and pescaíto. They offer great quality and are very reasonably priced. The restaurant is always full, despite having overflowed onto the neighboring pavement, so make sure you rrive early to get a seat! Let me know if you get there! Ohhh thank you! This sounds great– next time for sure! I am so happy I found your blog! My friend and I will be in Malaga for 11 days the beginning of September and I can’t wait! 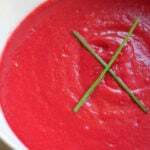 Your 1st post I read was Antonia’s Salmorejo. I can’t wait to make it, and can’t wait to try the many foods there. And Gazpacho! Mine is chunkier rather than fully pureed. Again, I can’t wait! Thank you for so much information! Hi Don! That’s great– 11 days is a great amount of time to truly see Malaga. Will you be staying in an apartment with kitchen facilities? If so, be sure to head to the local market to shop and cook at home! And if you’d like a tour of some of the best tapas bars in Malaga, check out my Devour Malaga Food Tours! Thank you Lauren. We’ll actually 3 nights in Estepona, 3 nights in Malaga at an Hostel right on the waterfront, 3 nights in Nerja, and the last night back in Malaga. I already wish we had more time! We will check out the food tour! I’m making the Salmorejo tomorrow night for Tuesday. I’ll probably have to use prosciutto because I don’t think I’ll find Serrano ham. I will grab a high quality extra virgin olive oil though. I can’t wait to taste it! Looks really nice but can you get the same food in the rest of Spain as well? 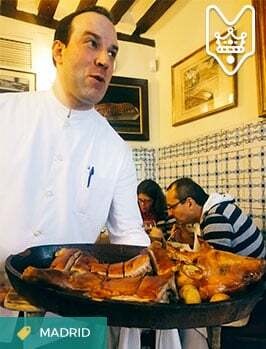 The great thing about Spain is that each part of the country has its own unique gastronomy! Pingback: Madrid Gastro Guide: Where to Eat in Madrid - An Insider's Spain Travel Blog & Spain Food Blog! I’ve just read your blog and appreciate all the tips for tapas. I’m not a fish-eater but do like prawns, crab and scallops. I’d love to try the espetos but I don’t know if you eat the heads or not? Also if served prawns in their shells, how do I eat them and again, what do I do with the heads? Thanks for any help you can give. Most don’t eat the heads (some do!). For prawns, most just pull apart and take off shell with hands (messy, but effective). 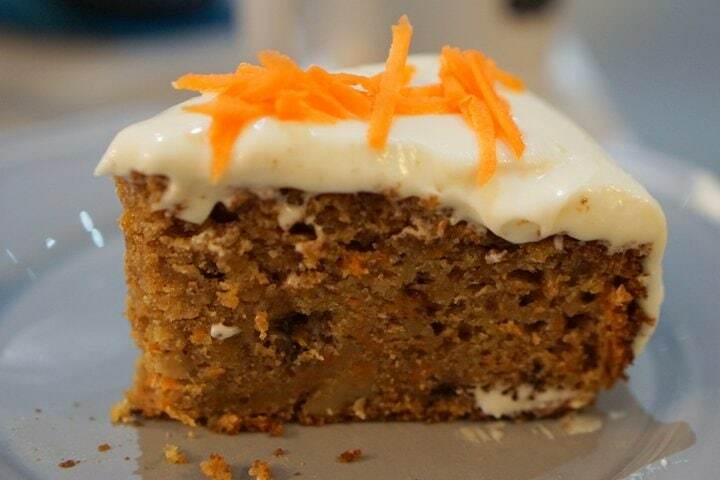 Others have mastered the art of doing this with a fork and knife… hard! Many thanks for your help. I’m looking forward to trying more fish! I lived for ten years in Marbella, 30 minutes from Malaga. The transformation of Malaga has been amazing and certainly worth a visit, or a longer stay. There is so much to see and to do and to visit nearby, the new port, new wonderful museums, international festivals and a famous tapas route in the city where Picasso was born. Great restaurants and a gastronomy all its own. (Casco Antiguo) is one of the most charming in Spain. 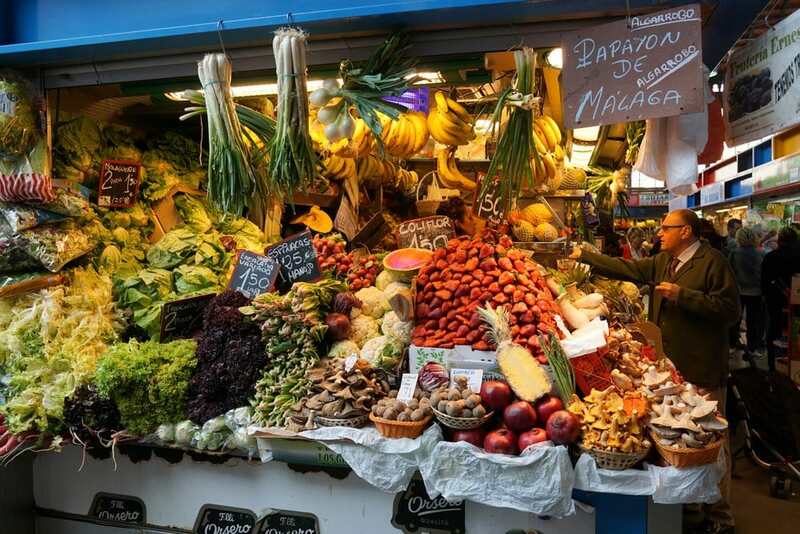 It forms a entire, pedestrian, section of the city, full of quaint restaurants, cobblestone streets lined with old lamposts and geraniums and fabulous tapas bars. Take a drive through the mountains in Andalucia, and enjoy the quaint “white villages”, “pueblos blancos”, each one with its own style, its own history and its own specialty. Enjoy Spain, it is an unending surprise for all the senses. Thanks for your comment! I’ve actually never been to Marbella– I must change that! Great blog, very informative, my family will be over there this August for 8 days for my 50th and may well join one of your tours. Do you by any chance know a good venue that could fit up to 40 people for the 50th birthday celebration in the Malaga area? It is in mid August and so far all we have is Sunset beach and the menu is not great and there is no dancing just lounge music. We would like about 5-6 hot and cold tapas and paella as well as sangria and other drinks. We want the venue to be opened to at least 1.00pm and have a playlist for music. Please help! Hi there – I would recommend the Malaga classic, El Pimpi! Super traditional and plenty of space/private areas. Enjoy!!! Thank you for your response, I will look into that option. Next week we will leave for Malaga. Although after having visited Malaga several times, there will always be something to discover (again), or expand the perimeter. When visiting Malaga, do not miss the automobile museum, even if you dont like cars. It is the largest private collection of cars, which is accompanied by iconic fashion of their time. Superb!